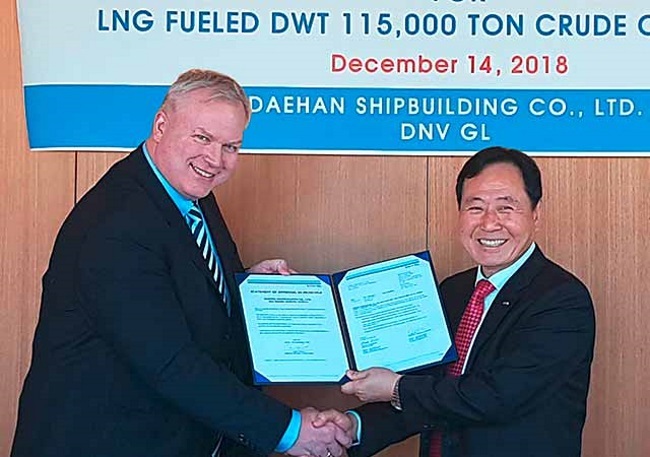 With liquefied natural gas (LNG) rapidly gaining ground as an eco-friendly ship fuel, Daehan Shipbuilding Corporation (DHSC), Korea’s leading builder of Aframax tankers recognized the need to build up competence in LNG fuel technology. To gain a competitive advantage, DHSC focuses on eco-friendly and fuel-efficient tankers satisfying the growing demand for vessels which not only comply with current and future emission regulations but feature an especially small ecological footprint. The company had not designed any gas-fuelled ships in the past and turned to DNV GL for support. In July 2018 the two companies launched a JDP with the aim of producing a ready-to-build design for an LNG-fuelled 115,000 dwt Aframax tanker. DNV GL provided comprehensive technical advice for the project. Vidar Dolonen, Regional Manager of Korea & Japan at DNV GL – Maritime, said: “We are pleased to have been chosen by DHSC as a partner for the project. We take this as a demonstration of trust in our expertise in gas-fuelled ships. As a first step we supported DHSC in understanding the implications of the IGF Code and our rules.” Furthermore, the classification society guided the shipbuilders through the process of preparing the design documentation required for approval. Vidar Dolonen, Regional Manager of Korea & Japan at DNV GL – Maritime (left), presents the AiP certificate to Yong-Duk Park, CEO & President of DHSC. Based on this knowledge transfer, DHSC compiled the drawing packages for the on-board LNG systems of the Aframax vessel and submitted them to DNV GL’s Approval Centre Korea (ACK) for review and verification. Thanks to the thorough preparation, DNV GL was able to grant the shipbuilder Approval in Principle (AiP) for the design at the end of December 2018. The complete design is now ready for execution and available to interested customers. “We appreciate DNV GL’s efforts to ensure a successful JDP. Widening and deepening the technical expertise is essential to achieve DHSC’s vision to be the best medium-sized shipyard in Korea. DNV GL is the right partner to accomplish this,” said Yong-Duk Park, CEO & President of DHSC. A key feature of the tanker design is its dual-fuel, low-pressure engine that can run on MGO or LNG. The vessel features two Type-C tanks holding 850 cubic metres each. Made of nine per cent nickel steel, a material typically used in cryogenic applications, the tanks and the fuel handling system are located on the upper deck in front of the crew accommodations, with the tanks oriented in longitudinal direction of the ship. This open-air placement above the cargo tanks is preferable on board oil and product tankers for safety reasons: in the event of a gas leak, gas cannot accumulate to dangerous levels in an enclosed space and ignite in the presence of electrical equipment or other ignition sources. Furthermore, the arrangement on deck means that no cargo space is lost to fuel tanks, which would be the case if a membrane tank system were used. 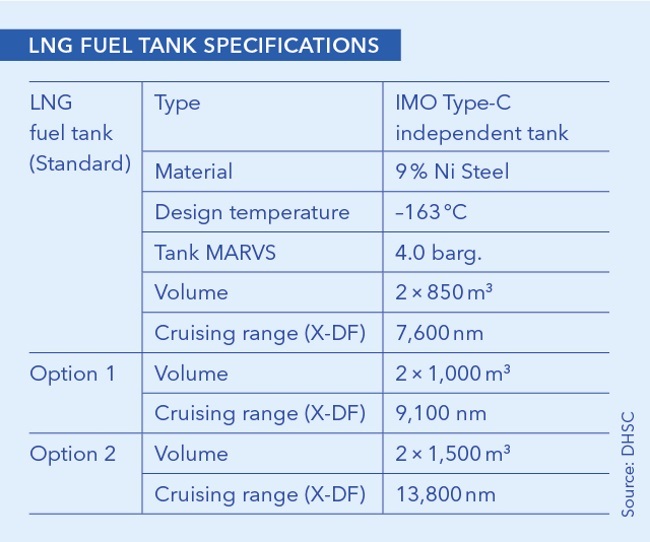 Type-C tanks are pressure vessels designed to handle significantly higher pressures and loading rates than other tank types. They are considered very safe and reliable, are comparatively easy to fabricate, and can handle the pressure increases caused by boil-off gas. DHSC leaves the choice of tank design – double-walled or foam-insulated – to the customer.